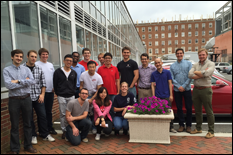 The University of Maryland Student Chapter of the Electrochemical Society (ECS) has received the ECS Student Chapter Award for the third consecutive year. The chapter won the ECS's inagural Outstanding Student Chapter Award in 2013, and the Student Chapter of Excellence Award in 2014 and again this year. Founded in 2011, the UMD ECS student chapter impacts education and research through its outreach activities and presentations at ECS conferences. Its diverse membership includes students from the Departments of Chemical and Biomolecular Engineering (ChBE), Materials Science and Engineering (MSE), Chemistry & Biochemistry, Electrical Engineering, and Mechanical Engineering. The group is advised by Professor Eric Wachsman (MSE/ChBE), director of the University of Maryland Energy Research Center. The ECS Student Chapter president, Thomas Hays (MSE) reflected on the past year: ”the success of our student chapter has come from our commitment to growing membership and the enthusiasm of our members for outreach activities. We are particularly proud of our continuing dialog with Senators and Representatives in Washington D.C. to highlight the importance of their continued support for scientific research."